Brimstone Brewing Co. and The Sanctuary Centre for the Arts work hand-in-hand to help create this destination, drawing locals and tourists alike to the offerings at the location on Ridge Road and aid in the revival of the community. In chatting with Jason Pizzicarola, a partner in Brimstone Brewing Co., he tells us the name for the brewery was derived from the location, a 20th century church in the heart of Ridgeway a community within Greater Fort Erie. They wanted something to reflect the location in a way that would draw attention to the beer, the location and the building they are housed within. Being part of the Ridgeway BIA, Jason was already helping to build the small town to a thriving community, and destination-locale with the help of other local businesses in the area. Adding the Brewery to The Sanctuary Centre for the Arts (also part of the old church), was a natural extension in driving community spirit, activity, arts and culture.The two work hand-in-hand to help create this destination, drawing locals and tourists alike to the offerings at the location on Ridge Road and aid in the revival of the community. Major building is taking place in the and around Ridgeway, making it a sought after locale for those moving to Niagara and those in the area, looking to get out of the city. Brimstone craft beers are fresh, of the highest quality and because of the small batches creative license in the varieties of beer brewed on site is easily attained. As a member of the Ontario Craft Brewers Association, they pride themselves in the ability to offer local, fresh, farm-to-table fair in the menu offered as well as the ingredients in the beers themselves. The Gothic Casual taproom along with the unique names of the beer all work in harmony with each other to create the authenticity of Brimstone Brewing Co.
We had the pleasure of meeting Joanne Latimer of Latimer Farms while she was delivering fresh vegetables from the farm for the restaurant. Not only, locally grown, but farm-country delivery as well. Initially, the beers were offered at festivals and events. In 2012, their signature beer 'Enlightenment Blonde Ale' became available in select LCBO locations. And this year, the ale received a silver medal for Canadian Brewing Excellence at the Canadian Brewing Awards. Brimstone craft beers can be found at festivals, local restaurants and bars as well as locations in Toronto and recently Kitchener-Waterloo. What you can expect from Enlightenment: "a unique American-style Blonde Ale that is lightly filtered and characterized by an active aroma and vivid golden hue. It offers a gentle bitterness from the hops that is complimented by a slight malty sweetness making a compelling and balanced sessionable beer. Lively and refreshing with a clean finish that will satisfy even the most discerning craft beer drinker." Zach Gagnon, the brewmaster graduated from Niagara College brewing program and wanted to share his talents locally having family in Niagara. Zach is driven by a simple philosophy in creating easy drinking beers for those not quite ready to delve into the full experience of craft beers, to creating experimental brews for those with a flair for a difference in the beers they drink. One of the beers we found most intriguing while at Brimstone, was the Loganberry Saison. And while intriguing, we also found it hard to believe Zach was old enough to remember the drink known to those who frequented the Crystal Beach amusement park which closed in 1989. A dull pink, the Last Ride Loganberry Saison is a refreshing summer beer that may just revive a memory or two. If you don't know what we're talking about, you probably didn't frequent the park and ride the Comet all that often. … we were looking for the cauldron! 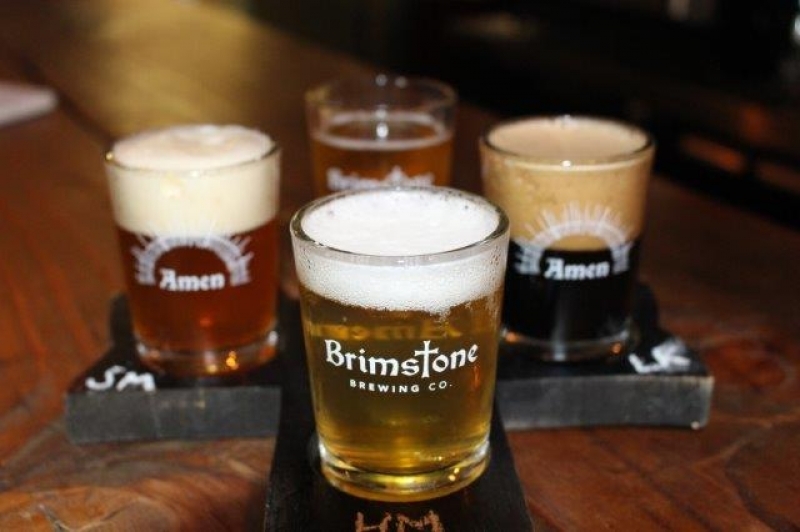 Make a point of visiting Brimstone Brewing Co., you will love the experience www.brimstonebrewing.ca But remember, it is a craft brewery - not all beers are available all the time - there is a new brew happening and waiting to be sampled… enjoy the experience.